For a game that was supposed to do away with bases, I seem te be rebasing very often since Age of Sigmar was released. To be honest it's mostly me, I just want my models to look right (and prefer round bases for that) and I don't mind trying out new things (like multiple models on a single base). The occasional rebasing is just part of the cost for this attitude. 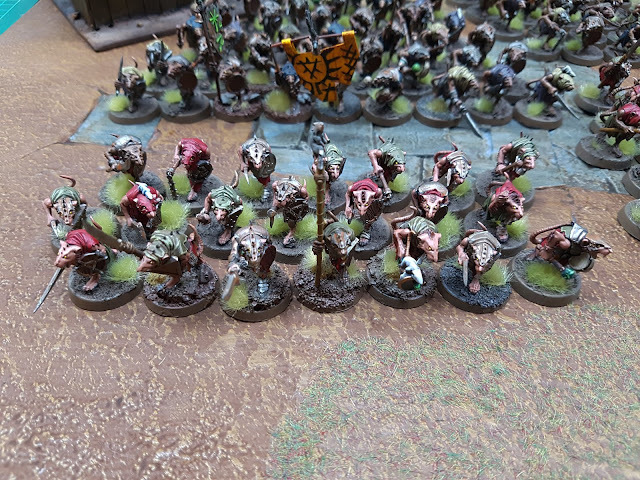 As it stands now, AoS plays better if each model has it's own little plastic bit of the world to stand on. Which brings me to my Skaven. 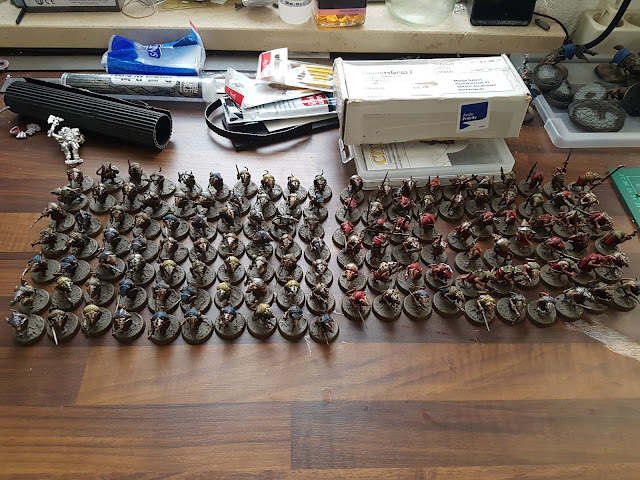 By my last count I had 149 painted Clanrats. This count turned out to be off by 1. I discovered I have 150 painted Clanrats (don't worry they aren't particularly well painted, just reasonable enough to serve on the tabletop). Of these I had 130 on joined bases of (on average) 5. This helped speed play, but it makes piling in difficult and moving over and around terrain a nightmare. For a while now I knew I would have to rebase these models. But this wasn't a job I looked forward to. I finally bribed myself with a nice glass of whine and luckily it turned out that a few simple tricks make it a one evening and one lunchbreak type of job. Only two feet broke off at the ankle during this part of the operation. Both where fixed later on. 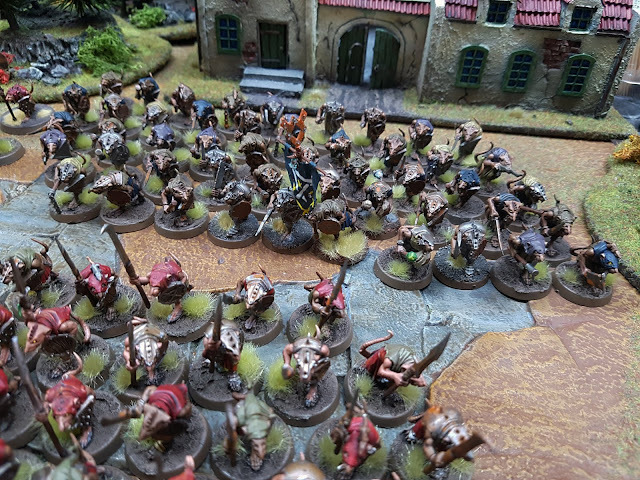 The hardest part was to peel to Skaven off their cavalry sized bases. I had stuck them on with liberal amounts of PVA. In the end it turned out to take a bit of care and occasional help from the scalpel to cut the rats loose. Then I had to use the scalpel again to scrape most of the gunk off the bottom of their feet. Add primer, then add the base rim color. Never skimp on primer, it will just make the base color go on badly. Next up I covered two plastic lids with broad masking tape. The tape was applied sticky side up and smaller strips held it in place. This helped me fix the 130 bases I was about to 'quick base' into position for airbrushing. First with a German Grey primer and second with the Air variant of Steel Legion Drab. I don't really like this as a base rim color anymore, but all my Skaven have it so I decided to stick with it. After priming and painting I used a hair dryer to blow the paint dry. The next step is the most important one. 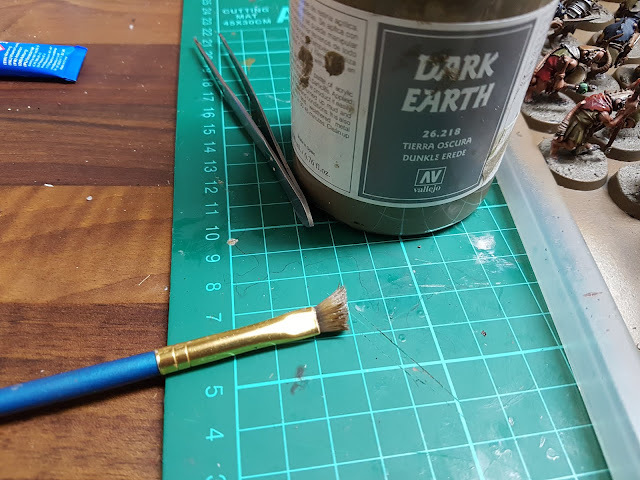 Using Vallejo Dark Earth paste I texture and color my bases in one go. 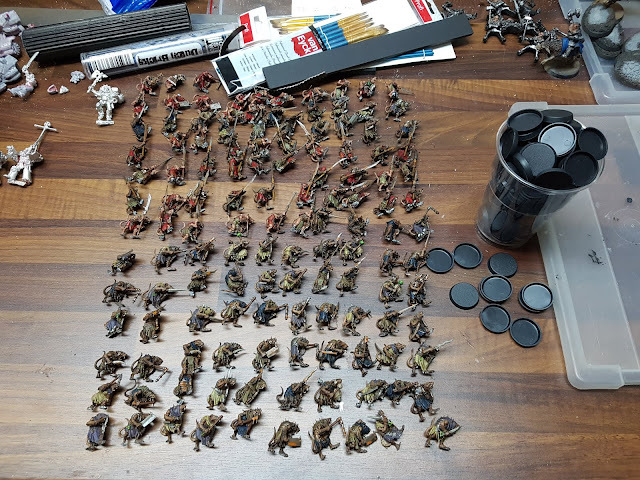 I work in groups of ten and use superglue to fix the models in place with the Dark Earth Paste still wet. This has two advantages. With the texture paint still wet I don't get the wobbly feet I would get on a dried up texture as the feet push the paint aside. Superglue reacts with the moisture in the wet texture paint, making the bond form earlier. After fixing Skaven number 130 in place I let the entire project dry for the night. Alas poor brush, I knew him well. Quick pro-tip: never use your W&N Series 7 for texture paints. 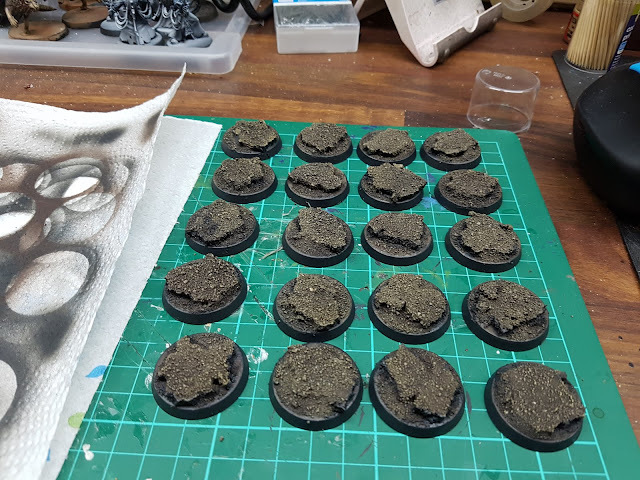 I personally prefer putting a dot of texture paint on a number of bases with a Q-tip and then spreading it out (with a mix of stiple and smear action) with a cheap brush. 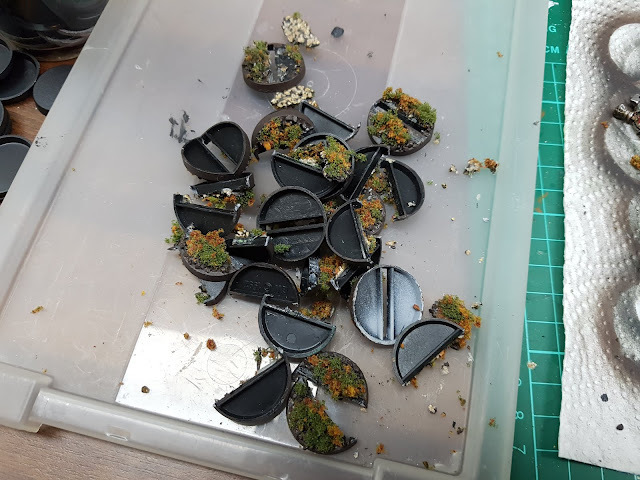 This is what was left of the (new) brush I used on these 130 bases. The next day I removed the small pieces of masking tape from the trays and then peeled back the larger pieces holding my models down. I've learned through laziness never to leave masking tape on too long (or you get bases that stay slightly sticky forever). 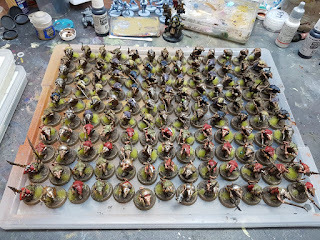 Next up I poured some Agrax Earthshade into a bottle cap (easy and cheap instant pallet) and used another cheap brush to cover the top of each base with the wash.
Found the time, Skaven ready for action (as soon as the wash is dry). And here they were freshly washed. Next up, waiting for the models to dry and adding some tufts to make the mass of monsters look more interesting. And here is a final shot after sticking a full box of Mordheim Tuft onto the bases. 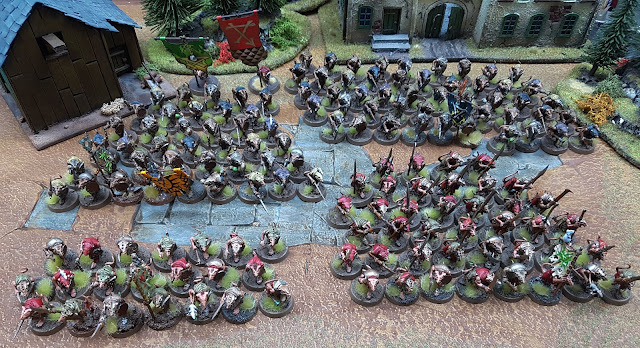 You can also run this tutorial with GW texture paints of course, but the Vallejo ones come in a much bigger pots (at a better price) and offer quite a lot of choice in color. I would advice buying them in store as the color displayed on a web page has pretty much nothing to do with the color in real life. I've included the command figures that had to watch the process from the display case and stuck my two battle standard bearers in the position of honor (in the rear). Moving on to Ruglud's Armoured Orcs and their unfortunate 25mm rounds. I wasn't fully done rebasing that evening. 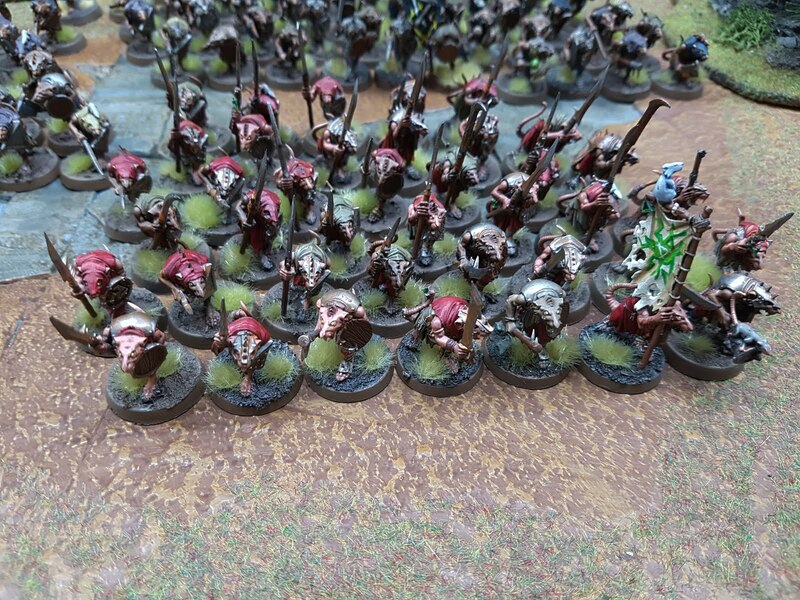 Another unit in my cabinet is Ruglud's Armoured Orcs. 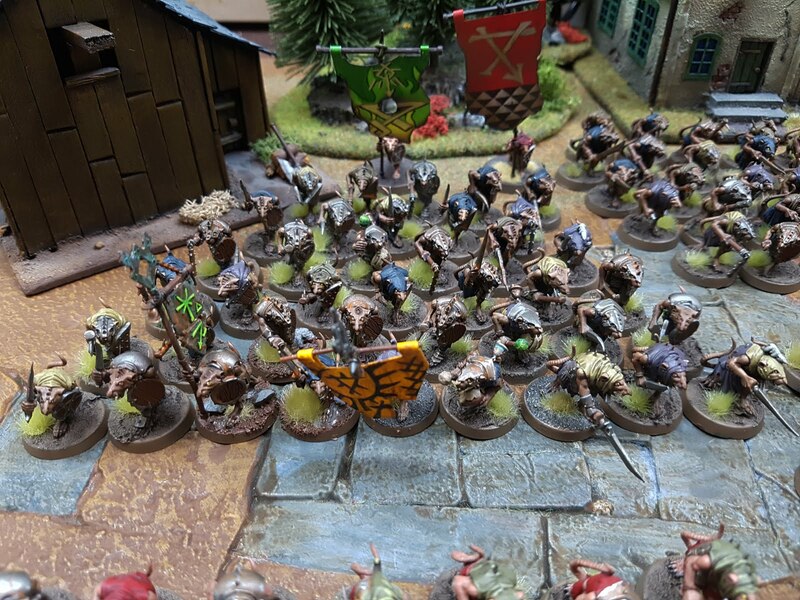 I have reacquired and repainted this unit a few years back and later even expanded it by adding three extra orcs/orruks to make the unit size a cool (Sigmar friendly) twenty strong. 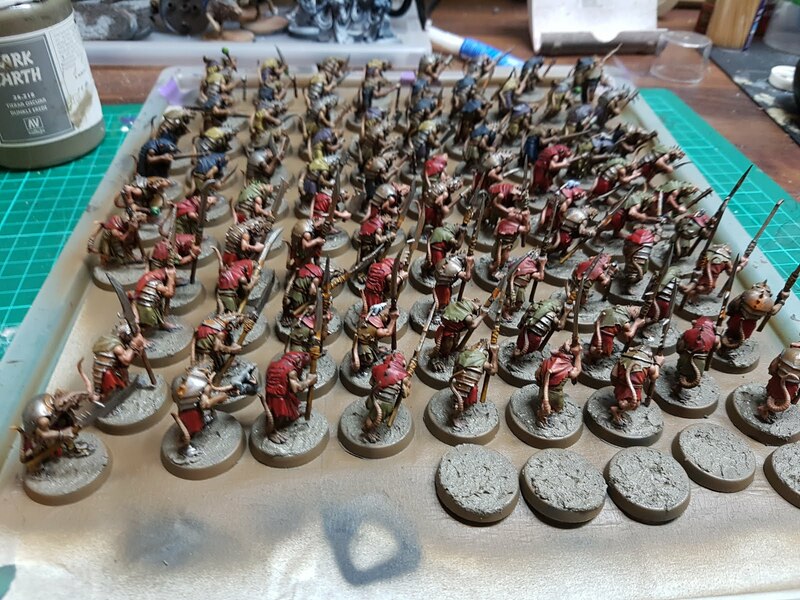 Unfortunately when I painted them 25 mm round bases seemed quite reasonable as a replacement for their 25x25mm squares. 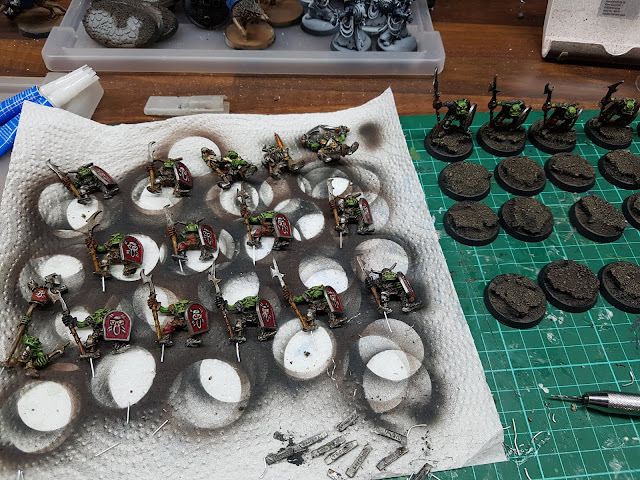 I even tried some old school basing on them. Now I need them on 32mm bases and I decided to take the opportunity to bring their basing in line with most other greenskins in my collection. Preparing 32mm round bases for Orc occupants. 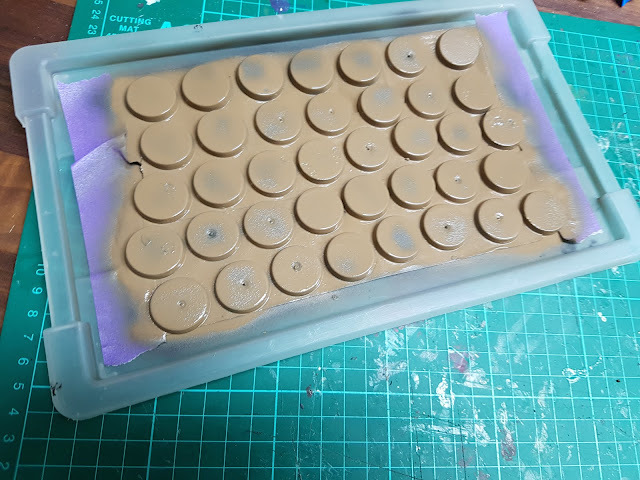 I started out super-gluing some cork to twenty 32mm bases. This helps raise the older smaller orcs heads to the same height as a modern day plastic ones. I covered the corked bases with PVA, poured a sand mix on top and then primed and airbrushed the bases in Dryad Bark. To finish off I drybrushed them Talarn Sand followed by Karak Stone. Then I painted the rim German Grey, using this color to fill up any missed patches on the rest of the base (I know, lazy). 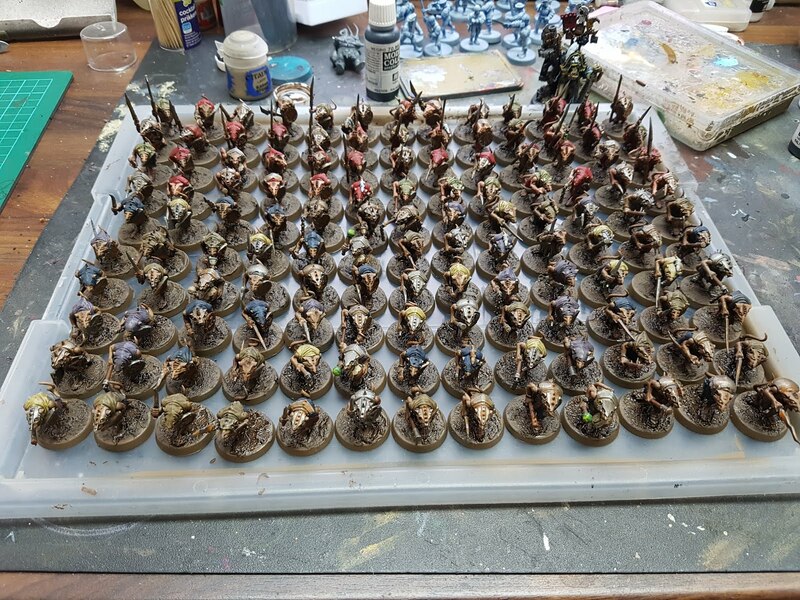 In this case I had to break the individual bases in half for most of the models to get them out. 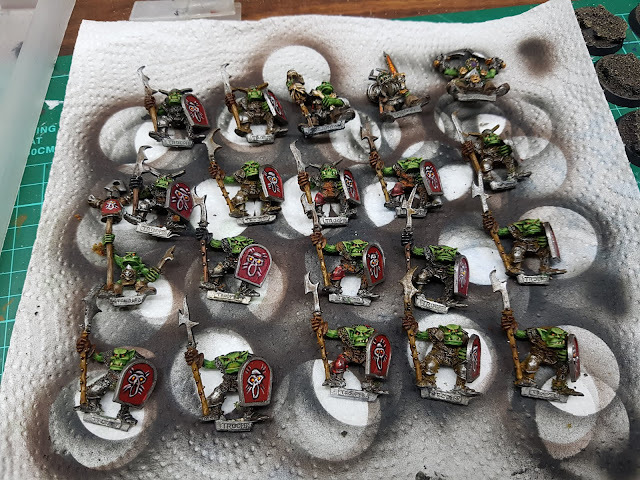 This was necessary because I wanted to prevent damaging the paint job on these orcs and most of these bases had a layer of small stones PVA'ed to them. Wave goodbye to the slotta tabs at their feet. Next up it was time to put on a horror show for the mint-in-box collector types. 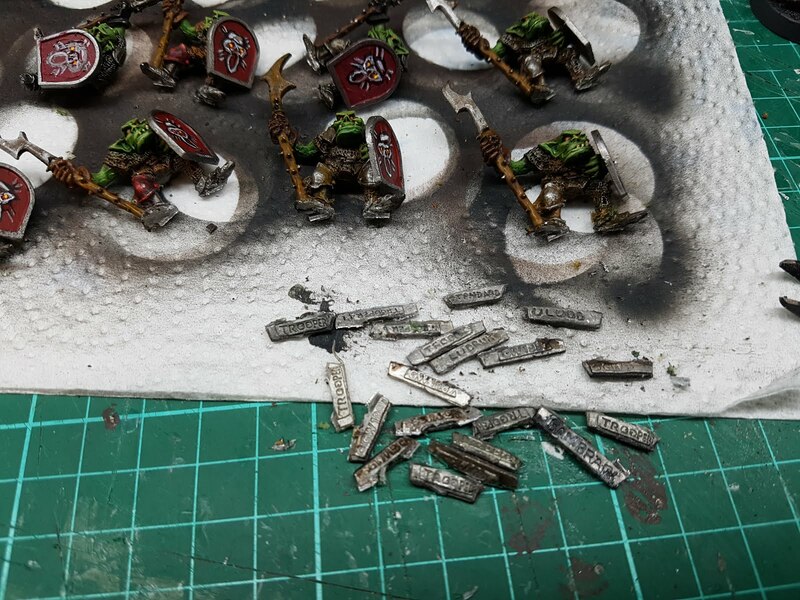 I cut off the tabs on the bottom of the orcs feet and I heard a sound as if dozens of blister-lovers cried out in terror and where suddenly silenced. 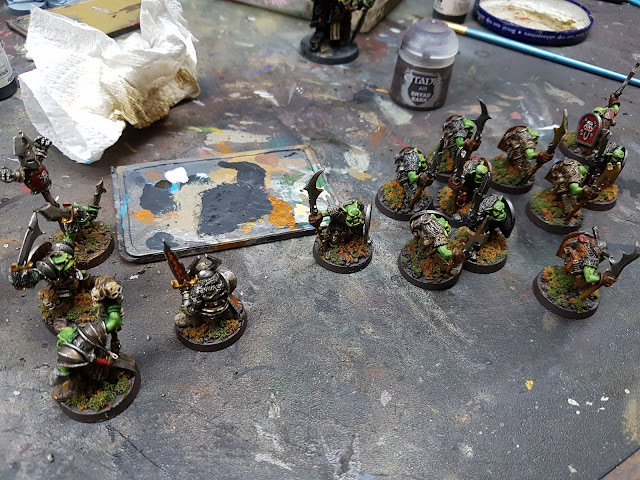 Add a pin to each orc to ensure proper adhesion to the 32mm base. I followed up by super-gluing a pin made from a paper clip into the foot of every model, using a pin vice to make a hole first. Then - using the same pin vice -I drilled a hole in my prepared bases. Next I added superglue to each orc foot and then pinned and superglued them onto their new base. 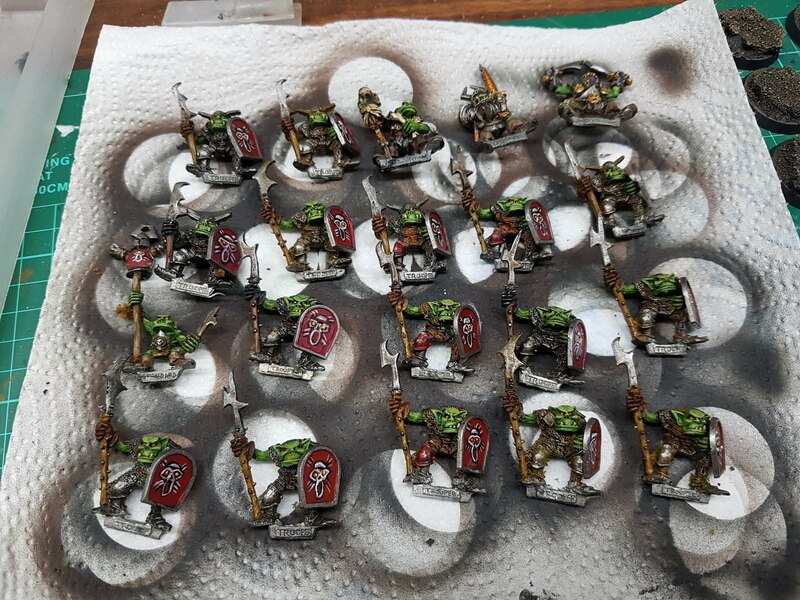 I would never have guessed the many dunks in paint stripper and multiple rebasings these orcs would go through on the day they where bought. Last, but certainly not least, I used a liberal dose of grass tufts to (sort off) smudge the rather straight edges of the cork and the rest of the base together. 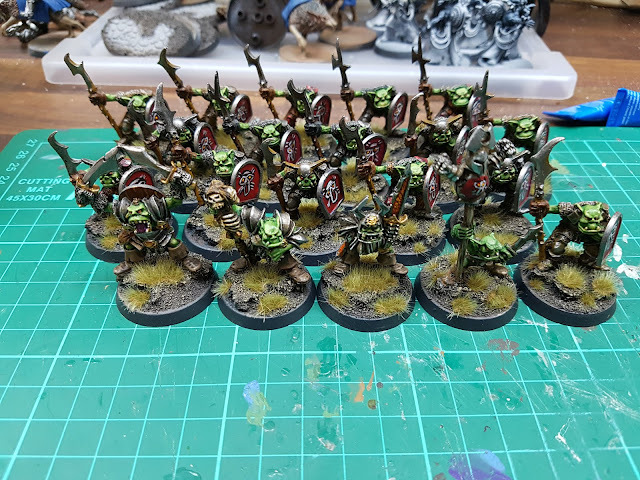 Now Ruglud's Armoured orcs are ready to continue terrorizing the Mortal Realms in style on a proper sized base (and hopefully I'll reduce the amount of opponents asking me if those are goblins...youngsters these days, no memory of the old'uns that came before ;) ). Hey those look great after all that work. Rebasing is a danger of course, because you might discover that you really like some other basing and move on to that next. As to crackle paint. I have a bottle of Vallejo Crackle Medium that is a complete mystery to me. No matter which tutorial I follow I've never gotten it to crackle (properly). So I wouldn't recommend it. I have a lot of the GW stuff and it a bit of a hit and miss (if you don't apply an undercoat of PVA). I also have a pot of AK Light&Dry Crackle Effects that seems to be doing the job. It looks slightly more expensive on a per-pot basis, but as it contains 100ml as opposed to 24ml it is actually better value.